WITH all the interest shown in various anniversaries this year, one slipped past almost unnoticed last month which might have topical relevance. It was 90 years since the Daily Mail published a front-page story, four days before the October 1924 General Election, about instructions supposedly sent from Moscow to British Communists, on how to subvert the armed forces and bring about a revolution, - supposedly with the help of the first Labour government. Labour had opened trade and diplomatic relations with the Soviet Union that year, then lost a confidence vote from the Liberals for deciding to drop the prosecution of communist John Ross Campbell under the 1797 Incitement to Mutiny Act, for publication of an open letter in Workers Weekly calling on soldiers to "let it be known that, neither in the class war nor in a military war, will you turn your guns on your fellow workers." New national elections were scheduled for October 29. On October 10, the Foreign Office received a document purporting to be the letter signed by Grigori Zinoviev and Arthur McManus of the Communist International, and hence referred to as the "Zinoviev Letter". Thought to have been the work of Czarist Russian emigres out to sabotage Anglo-Soviet relations, or possibly even commissioned from them, the forgery was nevertheless treated as genuine, and through the collusion of the intelligence services and Tory Central Office it was passed over to the Mail for publication. 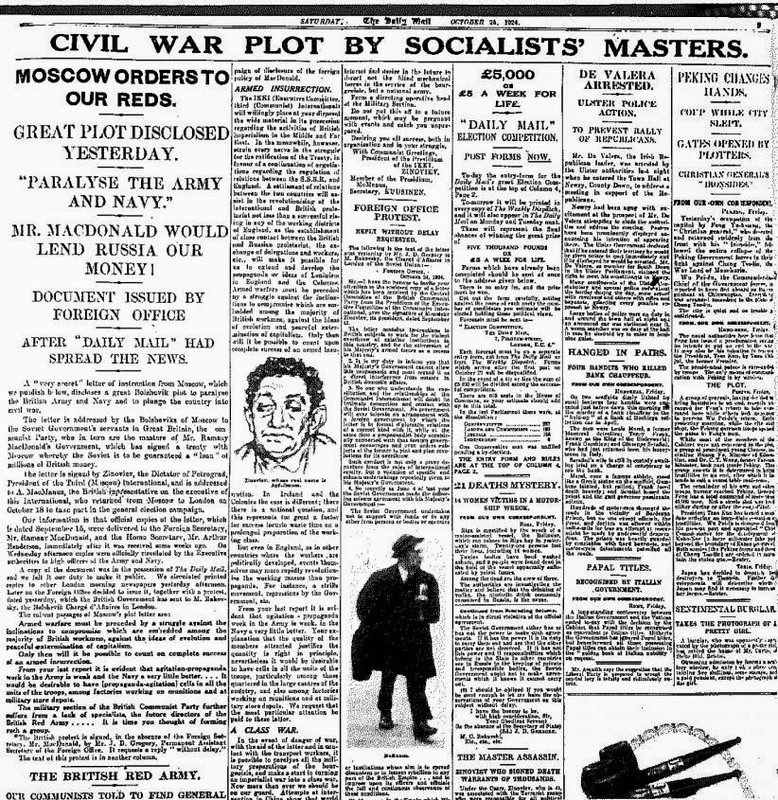 "CIVIL WAR PLOT BY SOCIALISTS' MASTERS" was the Mail's headline. Plainly aimed to strike fear into the middle class, it certainly put the wind up Labour's Ramsay MacDonald. Whether or not it made a big difference to Labour's vote, it made clear that senior officialdom in the state would not let an elected our government do as it pleased. A leading part in the behind the scenes collaboration between state intelligence services, Tory party and media was played by Major Joseph Ball, whose shadowy career took him from MI5 and the Zinoviev Letter to Conservative Research Department, and links with an antisemitic magazine that was used to smear Leslie Hore-Belisha, and remove him as War Minister. Handling secret contacts between Prime Minister Neville Chamberlain and Mussolini's diplomats, Ball also set up spying operations not only against Labour but against those anti-Appeasement Tories around Winston Churchill. Ball then had a hand at the start of the Second World War in deporting "enemy aliens" -often anti-Nazi refugees. All this may seem a long way in the past, though we do get occasional echoes. The Mail went for Ed Miliband's refugee father as "anti-British" , though he served in the Royal Navy. Unable to frighten us with Zinoviev or the Soviet Union, the Tories make do with denouncing Len McCluskey and Unite the union as "masters" of the Labour Party. Alas, as a Unite member I regret its not true. But nowadays, the stories can be more subtle, and plots more insidious. Lynton Crosbie, the Aussie whom the Tories hired as campaign strategist may not be a tough guy like Major Ball, but he has a reputation though he operates in different times. This weekend the big story was supposed to be Labour MPs wanting to ditch Ed Miliband as a loser before he is even put to the test. It was the Observer's front-page lead. Now the Observer has not got the Mail's reputation as a right-wing rag, nor its history. (Well not quite. I'll deal with the so-called "Red House" story and the police raid on the WRP school another time). it's certainly not aimed at the same readership. The Observer has a naughty little article today claiming there are "at least" twenty shadow ministers calling for Ed Miliband to stand down. I say naughty, because the article fails to name even one shadow minister. And considering there are only about 24 shadow ministers in the entire shadow cabinet, "at least" 20 would have to be just about all of them. Including Ed Miliband himself. In fact, the whole article is so ridiculous in its anti-Labour spin and propaganda, it's exactly the kind of thing you'd expect to see in the Daily Mail. So why is the Lib Dem Guardian/Observer employing a hack who writes anti-Labour articles for the Tory Mail? Another example of the Lib Dem /Tory coalition in action perhaps? from 2009-10, ruled himself out as a leadership contender today. and warned that remov Miliband now would be political suicide for Labour. Not to be outdone by the Observer with its anonymous quotes , the Independent has another story about people being against Miliband, of a more specific kind. It claims wealthy Jewish donors regard Miliband as "toxic" because he and other Labour MPs voted for recognising Palestine. One prominent Jewish financial backer, a lifelong Labour supporter, said he no longer wanted to "see Mr Miliband in Downing Street or Douglas Alexander as Foreign Secretary". A senior Labour MP warned that Mr Miliband now had a "huge if not insurmountable challenge" to maintain support from parts of the Jewish community that had both backed and helped fund Tony Blair and Gordon Brown's election campaigns. At the same time, a former cabinet minister privately admitted that Labour's fundraising efforts were in disarray. The former minister said the party would struggle to raise anywhere near the £19m a party is entitled to spend under electoral law in the run-up to next May's poll. "We will have to pass the begging bowl round to the unions," they said. "That would send a bad signal. In return, they [the unions] would demand to call the shots on policy." It's an ill wind that blows no good! But are Jewish donors that important to Labour nowadays? And are so many presumably intelligent professionals and shrewd business people really taking their line from 'Beaty' (Maureen Lipman) and Mr.Netanyahu and his embassy, when there is so much dissent within the Jewish community over Israel's stubborn and aggressive policies? A very large number of prominent Israelis, including former intelligence chiefs, wrote to British MPs before the vote, urging them to vote FOR Palestinian recognition. Unlike the sources quoted by the Independent, these people not only know what thet are talking about and were only too willing to give their names, and positions held. Assuming the people quoted in the Independent are genuine, but too shy to give their names, who was it it, I wonder, who put the reporter on to the story, and to them, in the first place? I suppose we could make some intelligent guesses. And they would not be Labour Party members. Besides telling possible pro-Israel and Jewish donors what attitude they are supposed to take, rather than leaving them to think for themselves, the article has also woken the sleeping dogs of prejudice, for whom any mention of Jews and money in the same or nearby sentences sets them yapping, even if they haven't a clue what its all about. And between now and the general election in May I expect there'll be all sorts of stories. ...Lynton Crosby had concentrated on the visceral issues that have been proven to bring out the core Conservative vote. This is how he has always operated – and he should under no circumstances be underestimated. He is the genius behind the most successful Right-wing politician of the last quarter-century, Australia’s John Howard, who was elected four times between 1996 and 2004, and remains the second longest-serving Australian prime minister, after Sir Robert Menzies. Working for him, Crosby developed what opponents labelled “dog whistle” politics – campaigning techniques which sent out a covert message. John Howard’s enemies claimed that this was sometimes implicitly racist.